(Bloomberg) -- Amber Capital is so bullish on Greece that it only wishes there were more stocks it could buy. To Oughourlian, the problem is that since he’s shunning Greek banks, there aren’t many domestic plays left. He’s bought telecom company OTE (up 6 percent in the past year), construction conglomerate Ellaktor (down 2.3 percent) and the Athens Stock Exchange (down 12 percent). Amber Capital, which manages event-driven and bottom-up strategies and specializes in southern Europe, has a track record for being contrarian in the region. Early last year, Oughourlian was also bullish on Italy, where stocks have since plunged amid concerns over the country’s growing debt burden and sluggish growth. He declined to share returns on compliance grounds. Amber isn’t the only fund favoring Greece. Marathon Asset Management LLP said in a Feb. 28 note the country still presents “a significant value opportunity,” though the economic recovery is taking longer than expected. Of course, the coast isn’t entirely clear. The government has dragged its feet on some economic reforms, raising creditor concern. The International Monetary Fund also said this month that Greek banks need more capital and downside risks have increased. 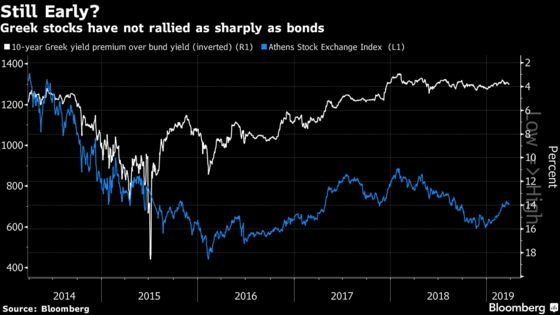 The Athens Stock Exchange Index has plunged 57 percent over the past decade, compared with a 113 percent gain for the Stoxx Europe 600. Beyond Greece, Oughourlian says a misconception is behind persistent outflows from Europe: that Brexit is the start of the region’s unraveling. Amber’s own European stock fund has kept exposures low, anticipating a bumpy road to the European Parliament elections in May. But to him, Brexit has a silver lining.